Dear Readers, I am SOOOO super duper BEYOND excited to announce that I am booked for my FIRST EVER AUTHOR SIGNING!!!!! [Enter the zillions of party Emojis!] I have been invited to join the RARE family. (Romance Author and Reader Events) and I am positively honored and thrilled! I had the pleasure of meeting (and dining and laughing) with the super sweet coordinators and so many fun authors and readers at the RARE17 Berlin event this past summer, so to receive an invitation to join the ranks of brill authors is just honestly ridiculously flattering and exciting. 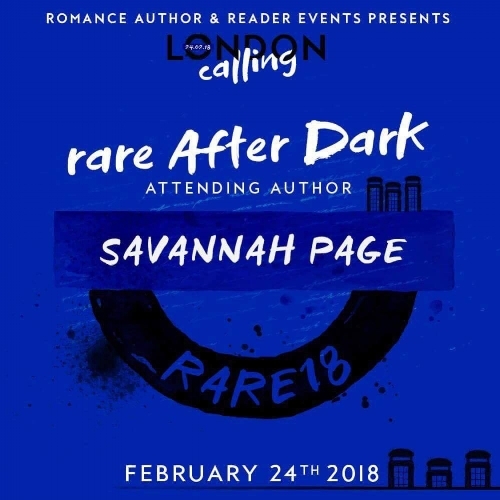 My first signing will be at the RARE18 London After Dark event, which takes place in, you've got it, merry 'ol London, England, in February! Eeeek!!!! I am so excited to be joining 19 other fantabulous authors during this after party signing. And boy am I excited to be a part of the RARE family! I can't stop pinching myself. Because that means, as a new sister, I'll also be signing at the official RARE event in 2019, also in London!! A booth, banner, books, and swag and all, my readers! 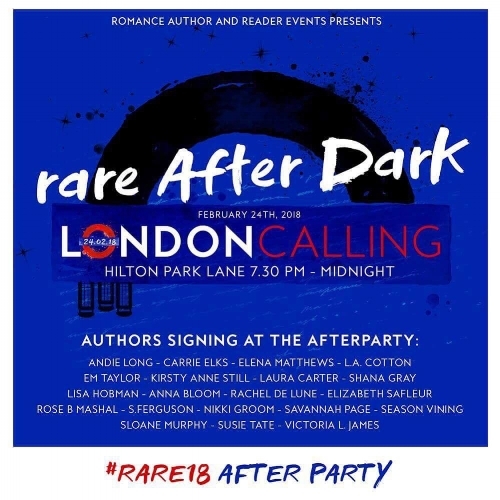 If you'll be attending RARE18 London I would LOVE to meet you, sign a book, and toast some bubbly and after party party with you! I'll also be attending the official event/signing that takes place during the day, but as a reader. Let me know if you'll be there and maybe we can meet up! For RARE event and group info you can check them out HERE on Facebook. It's a really fun community of thousands of readers and hundreds of authors and books. I mean, what more could you ask for? Please do reach out if you're already planning on attending! Unfortunately, tickets are already sold out for this huuuuuge event (I seriously cannot WAIT to go as a reader/fangirl! Two words: Colleen Hoover). But if you're in London 21-25 February 2018 and want to meet up please let me know! I'll be tagging along with fellow romance readers and authors most of the time...and doing some super touristy things too, of course. It'll be my first trip to the island, my first signing, and eeeek good golly!!! I just can't wait! To celebrate my first author signing how about a GIVEAWAY?! I just got in the post a box of really beautiful audiobooks of my new novel (coming 12 December), Everything the Heart Wants. I am so giddy to share this labor of love with you readers very soon. But for 1 lucky duck how about an advance audio copy? Entering the Giveaway is easy peasy. All of the details are located below and on my Facebook Page, via the Rafflecopter app. Good luck and perhaps I'll see you in London!! Happy Reading!